WASHINGTON — House Democratic leader Nancy Pelosi's call for Rep. John Conyers, D-Mich., to resign amid sexual harassment allegations came only after several days of internal party turmoil between party leaders who had been insisting that Conyers deserved an ethics investigation and rank-and-file members who said it was time for him to step down. Pelosi's remarks Thursday morning were an evolution from her position on Sunday, when she called the longtime congressman an "icon" and appeared to question his accusers on NBC's "Meet the Press." A parade of Democratic House leaders were soon making the same call, including Minority Whip Steny Hoyer of Maryland and Rep. James Clyburn of South Carolina. For most of the past week Democrats have grappled with how to address the misdeeds of a colleague who has been publicly accused by four women of sexual harassment but who had been instrumental in the civil rights movement. Pelosi began the week on “Meet the Press” by raising questions about the accusations against Conyers. "We are strengthened by due process. Just because someone is accused — and was it one accusation? Is it two?" Pelosi. Later that day, she issued a tougher statement, announcing that Conyers would be stepping down from his post as the top Democrat on the Judiciary Committee. The Democrats' divisions came to a head during the party's weekly caucus meeting Wednesday morning, where the conversation turned tense when the subject of Conyers came up. Eight lawmakers spoke on the topic, according to a source in the room. The leadership split with many in the rank and file by arguing in favor of letting the ethics investigation determine if Conyers should face any repercussions. Others said the party and the country could not make progress on having an honest conversation about sexual harassment until the party confronted its own problems. Rep. Linda Sanchez, D-Calif., who is on Pelosi’s leadership team, argued that Conyers should be allowed due process, insisting that members of Congress “shouldn’t be held to a higher standard” than anyone else accused of such misconduct, according to three sources in the room. Sanchez responded in a tweet saying that she does think members should be held to a higher standard and on Wednesday she also called on the Michigan Democrat to step down. Conyers continues to deny the allegations. After flying home to Michigan on Monday evening, the 88-year-old lawmaker was hospitalized Thursday morning for stress. Members of the Congressional Black Caucus, co-founded by Conyers, have been speaking with him since the allegations came to light last week, and they have also been divided, mostly along generational and gender lines. Older members sought to preserve Conyers’ legacy as a civil rights champion, while others said he should pay the repercussions for his actions. Clyburn, the third ranking Democrat in the House, had been a staunch defender of Conyers until he joined the resignation calls on Thursday. The Congressional Black Caucus was instrumental in urging Conyers to step down as the ranking Democrat on the Judiciary Committee, but the group has stopped short of calling on him to resign. "While the ethics investigation is going on, we think that is a decision for he and his family and his constituents to make," the caucus chairman, Rep. Cedric Richmond, D-La., said. Pelosi's initial handling of the accusations drew rebukes from critics and supporters inside the party. Some Democrats privately criticized her for not being more forceful in her condemnations. Some did so publicly. “I think Democratic leadership has shown very clearly where they are on this issue, who they’re standing with," Rep. Kathleen Rice, D-N.Y., said on Wednesday. "They don’t speak for me, clearly." One member, who spoke on condition of anonymity to be more frank, told NBC News that Pelosi's attempt at “trying to please everyone” wasn't working. Another member, who asked to remain anonymous to avoid angering party leaders, said people were looking for leadership to have a clear position that reflects opinion of the conference. “That’s what leadership is about," the member said Wednesday evening. "It’s about solving problems and protecting your members. They aren’t protecting their members." On Thursday morning, Pelosi changed her position, telling reporters that Conyers should step down. She also addressed his legacy again. “As ‘Dean,’ Congressman Conyers has served in our congress for five decades and has shaped some of the most consequential legislation in the last half century," Pelosi said. "However, zero tolerance means consequences for everyone no matter how great a legacy is — no license to harass or discriminate." 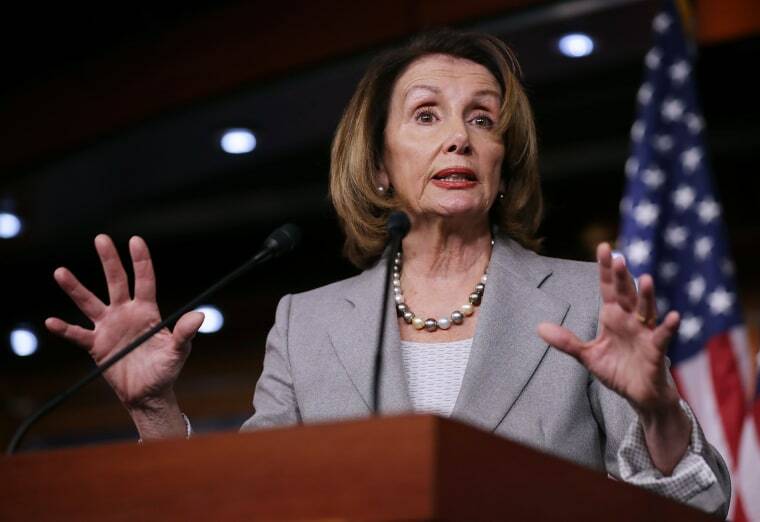 Rep. Jackie Speier, D-Calif., who told a House panel this month that she knows of two members of Congress — a Democrat and a Republican — who have engaged in sexual harassment, said Pelosi did the right thing on Thursday, adding that she is sympathetic to Pelosi's responsibility. "I think she had an overwhelming task, and I think that until you walk in her shoes, none of us know," Speier said. "She has to weigh everything. She's always interested in protecting the institution, and I think she recognizes that the institution has to be protected." Geoff Bennett and Alex Moe contributed.